Okay, so you’ve got your Bantam Tools Desktop PCB Milling Machine and you want to make circuit boards! However, an obstacle remains between your ideas and cutting out those traces on the mill: learning EAGLE. 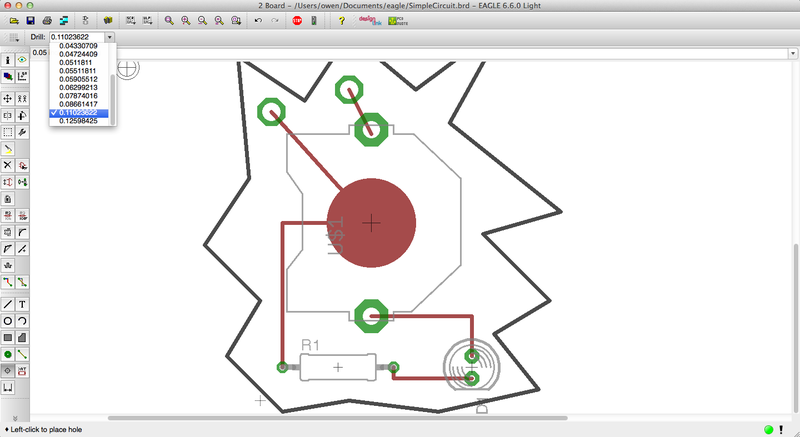 EAGLE is powerful software for making circuit boards, and its creators have made it free for boards under 4"x3", which works great for most projects. 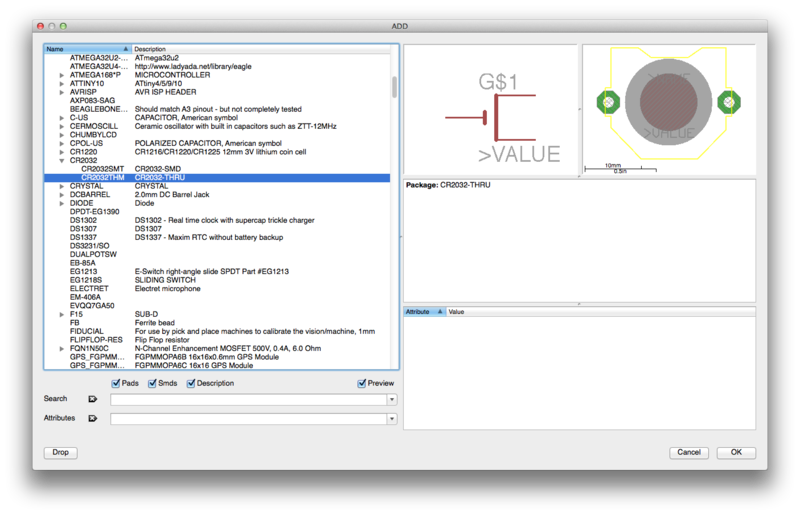 The Bantam Tools Desktop Milling Machine Software can import many kinds of files, but EAGLE is the most common for circuit boards. The support for EAGLE is so complete that all you have to do is drop an EAGLE .brd file into the software and click Cut. 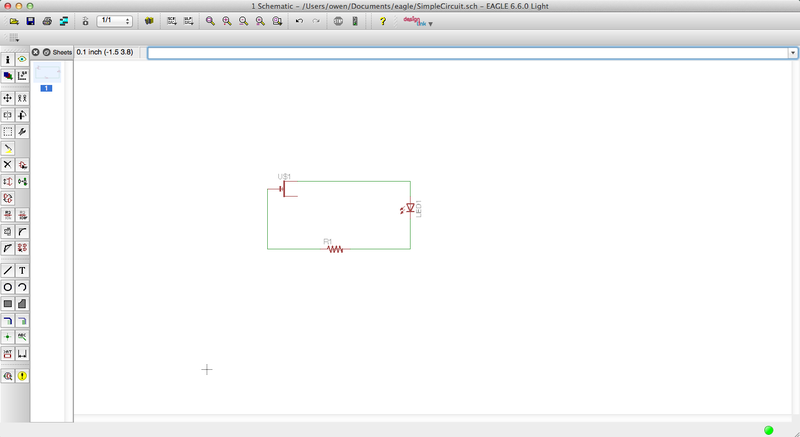 In this tutorial, we’ll go over the complete process of building a very simple LED circuit. This circuit may seem like a lot of work considering that it only has three components and just turns on an LED, but once you understand the process, you can scale it up to make much more complex designs. Hang in there and it'll be well worth it! You may also encounter a bug where you click something and expect it to move with the mouse, but it won’t. To fix this, simply switch to another application on your computer, then switch back to EAGLE. Hit Cmd+Tab twice. EAGLE also uses layers, which function in some ways like layers in Photoshop and Illustrator, except each layer has a specific purpose. 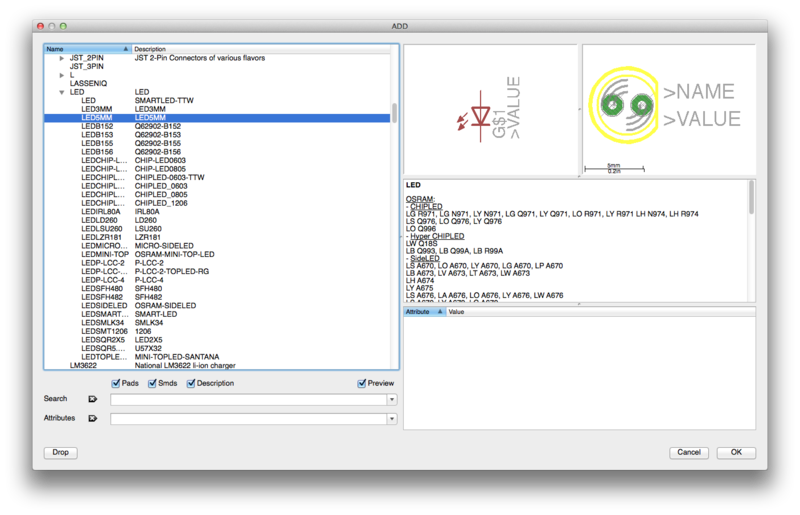 The software can read all the layers, which allows for awesome things like two-sided machining and solder stencils. 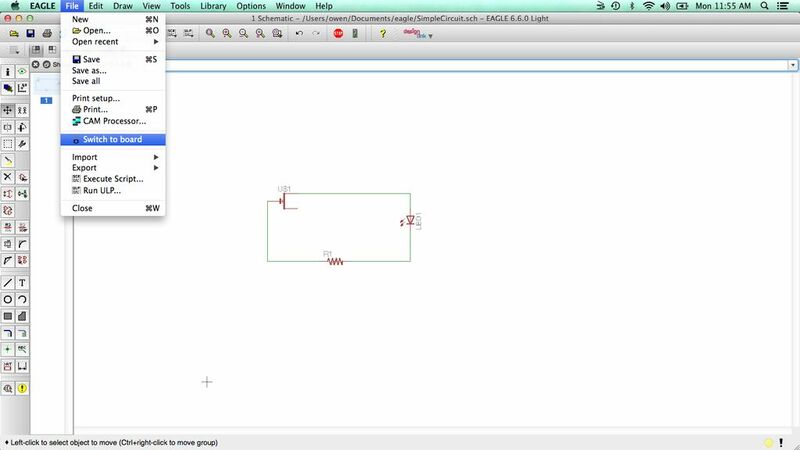 To keep this tutorial simple, we’re mostly going to use two of the layers: “1 Top” and “20 Dimension.” The software uses the Top layer for cutting circuit traces and the Dimension layer to cut the outline of your board. 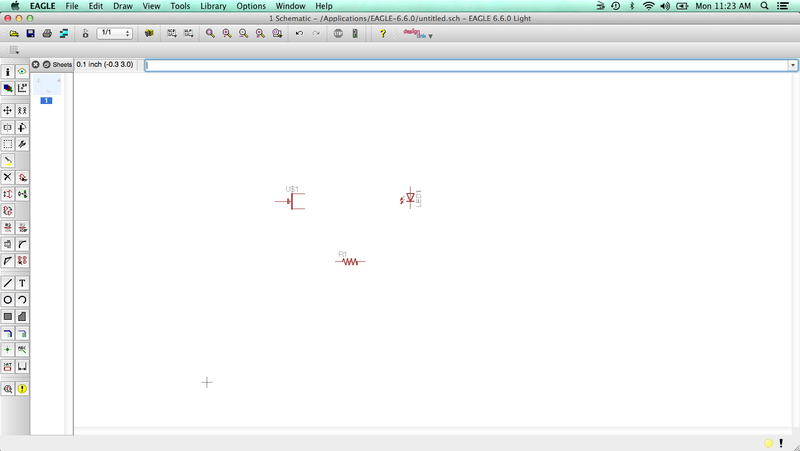 Step 1: Make a schematic. Step 2: Use the Draw, Move, and Delete tools. Try clicking a corner where two lines meet. It won’t delete it; instead it'll select one of the lines connected to that corner and ask you if that’s the one you're trying to delete. Step 3: Use the Group (Select) tool. You’ve learned how to manipulate single objects. To move, delete, or otherwise change a bunch of objects at once, you need to use the Group tool, which allows you to select many objects. 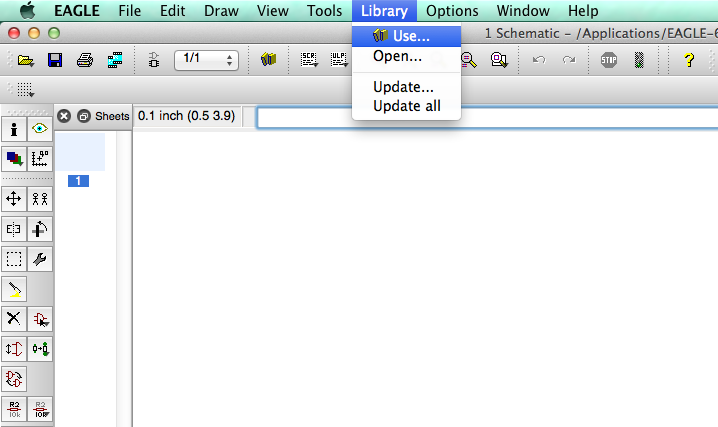 This is also the one tool where you actually have to drag, rather than clicking twice. Click the Group tool, and drag to select your whole circuit. Everything will turn bright red/green, indicating it’s all been selected. To move everything, click the Move tool, then right-click any of the selected objects. In the menu that pops up, choose Move: Group. This will pick up the group and start moving it. To place it somewhere, click there. This principle applies to many of the other tools, such as Delete, Info, Rotate, etc. 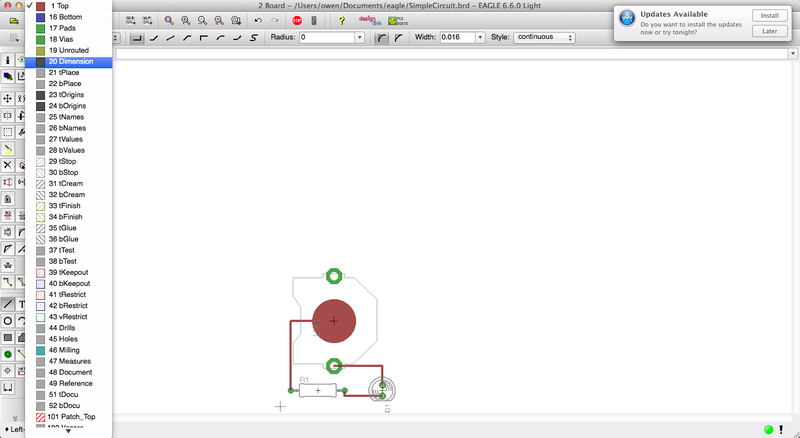 Step 4: Turn your schematic into a circuit board. 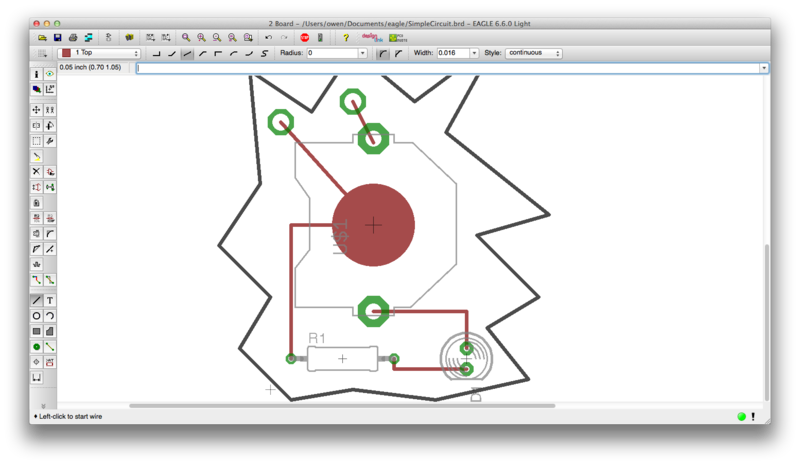 Now that you’ve built a simple circuit schematic, it’s time to take the next step and turn it into a circuit board. First save your file somewhere. The EAGLE folder in your Documents is a good place. Next, select File > Switch to board. Click Yes to create the board file. You’ll see a jumble of components in the lower left corner next to a big rectangle, which represents your board. In this case, it’s way too big, so later we’ll draw a new one. The jumble of components are the physical representations of the circuit symbols from your schematic, and your task is to put them on the board in the way that you need them to be for your project. In some cases, such as making an Arduino shield, there are very rigid requirements, but in this case, you can do anything you want. 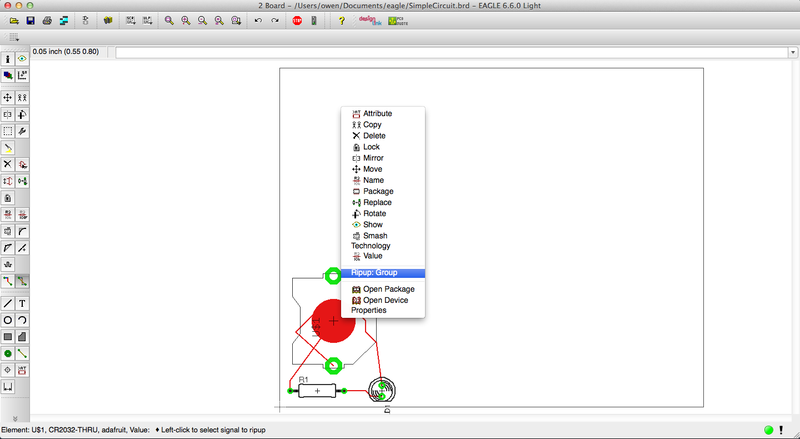 Select all the components and move them onto the board area. Move each component to where you’d like it to be. You’ll notice that they’re connected by thin lines. These are called airwires, and they represent electrical connections between components that have not yet been turned into traces, which are the physical copper connections that get milled into the board by the milling machine. Now you have two options. You can either manually draw traces between your components, or you can let EAGLE do it for you automatically. 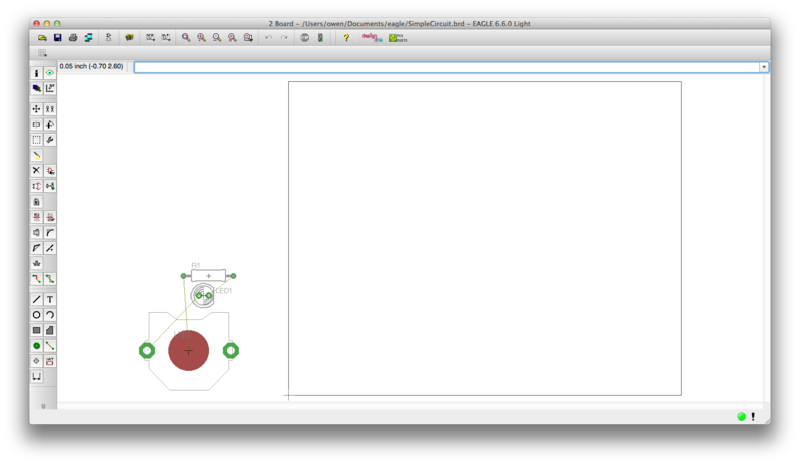 Because you took the time to draw a schematic first, EAGLE knows what is connected to what. Let’s try doing it automatically. 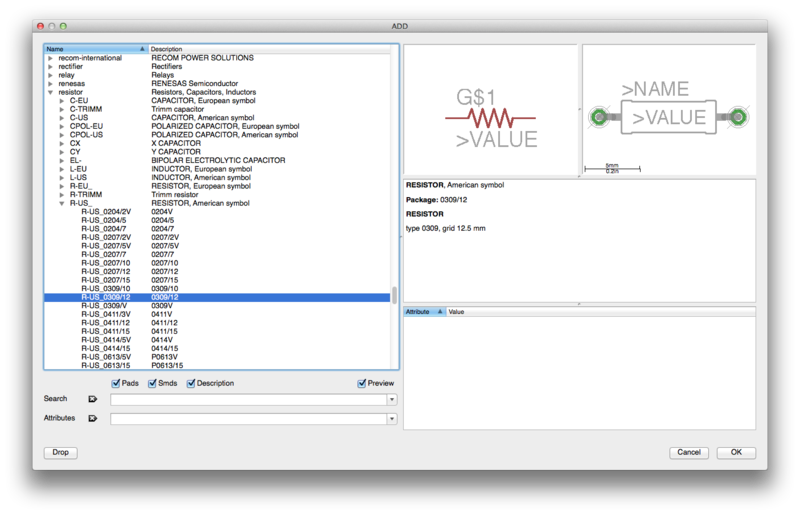 Select everything with the Group tool. 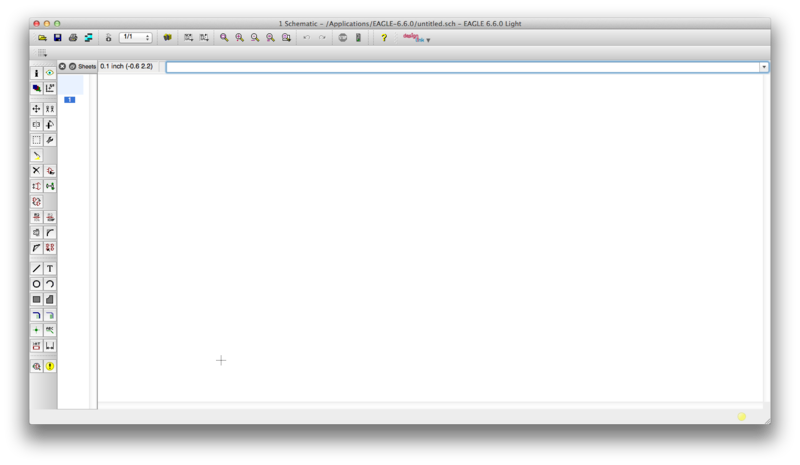 If you can’t see the last few buttons on the bottom of the left toolbar, click the down arrow to access them. 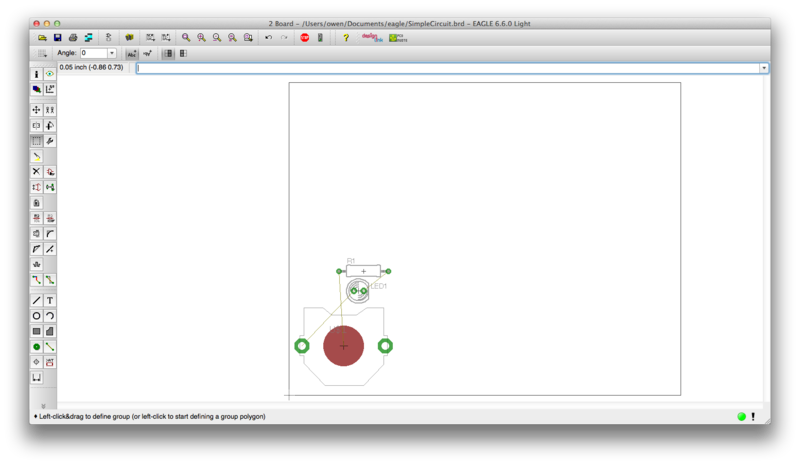 Click the Autorouter tool, and set Top to “*” and Bottom to “N/A.” Since this is a simple board, we can do all our traces on one side (the top). Click OK to route your traces. Step 5: Fix the traces. Now there are dark red traces between everything! If you arranged things like we did, there’s a little problem: the trace that runs from the positive battery terminal to the LED goes through where the battery goes. The symbol doesn’t fully show it, but the negative side of the battery could touch that trace and cause a short circuit, which we don’t want. Select the Rotate tool, enter “90” in the Angle box if it’s not already there, and click the battery. It should rotate 90° to the left. Click the LED a few times to rotate it until the traces aren’t crossed. Now the traces are all messed up. Let’s rip them up and try again. Click the Ripup tool, then click the Group tool and select everything. Right-click the selection and choose Ripup: Group. This will remove all the traces and leave only air wires. 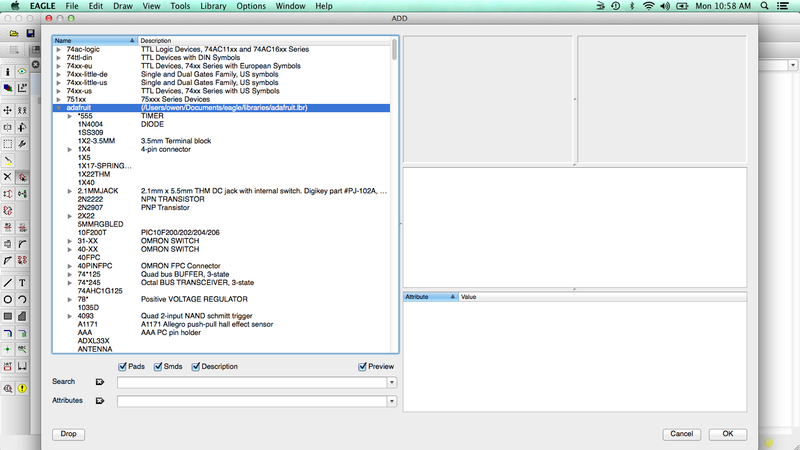 Select everything and use the Autorouter again. It should look better now with no wires crossed and the trace from the positive terminal going straight to the LED without crossing into where the negative side of the battery would be. Just for fun, let’s try routing the traces manually. Hit Cmd+Z to undo the Autorouter. 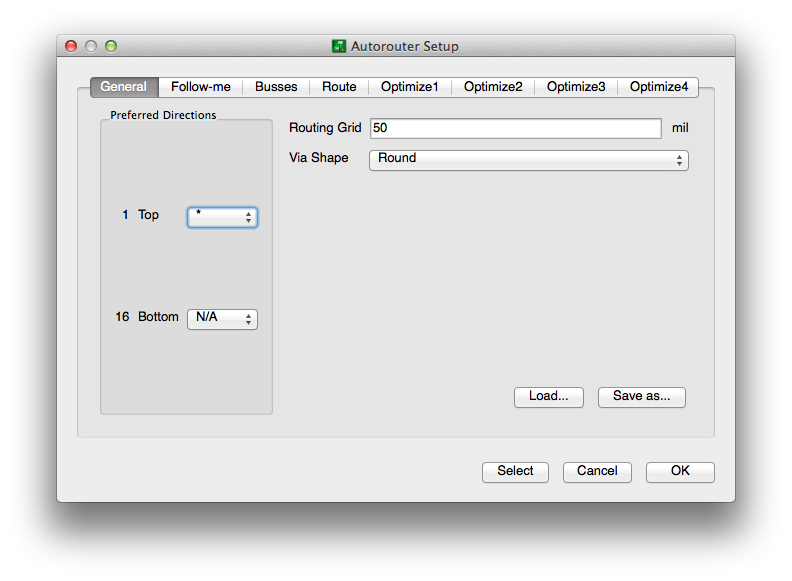 Click the Route tool, and click on an airwire. A trace will start, and you can connect it where it should go. Refer to the image for info about bend styles (i.e. how to make your trace go straight or bend the other direction). Do the same for the other airwires. Step 6: Draw the Dimension layer. We mentioned layers earlier, but now it’s time to get into them a bit more. You’ve made a circuit, and now you have to tell the software how big you want your circuit board to be. See the big rectangle you’ve been arranging components inside of? That’s what you need to make, except smaller. And cooler. Let’s make an interesting shape for our board. 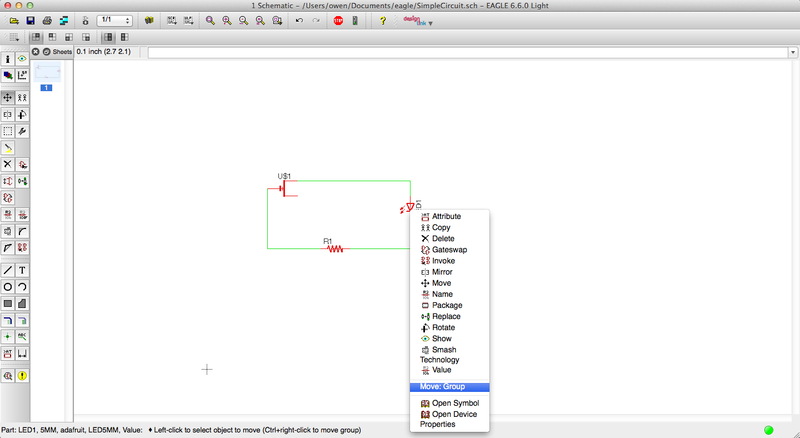 Delete the existing outline (the big rectangle around your components) using the Delete tool. Select the Wire tool and change the layer from “1 Top” to “20 Dimension”. The Dimension layer is what the software uses to cut the outline of your board. Draw a fun shape around your circuit. Save and you’re done. Yay! The next step covers information about additional tools you may want to use. If you’d like to do something like add a way to connect an external power source to your board, or make holes so you can mount or hang your board, read on. Otherwise you can skip to the final step, which is milling your board. You can download the board file we made for reference. It includes additions made in the next step. 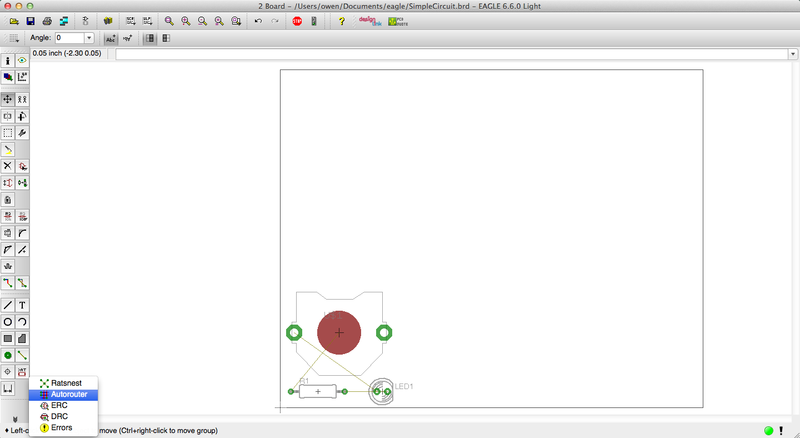 If you look at the components on your board, you’ll see that they have green circles at the ends, which are connected to other components by traces. The green circles are pads, and they have holes in the middle. The pins from the resistor, LED, and battery clip go through the holes, and you solder them to the pads. You can create this same pad and hole combo by using the Via tool. A via is technically an electrical connection between layers of a board, but for the purposes of this tutorial, it’s just a pad and a hole. Note: If you do two-sided boards, you’ll want to use vias to connect between the two sides. You’ll need to run a wire through the hole and solder both ends to achieve the effect of plating, which is done by board manufacturers. What would you use a via for in this tutorial? For example, if you wanted to add contacts so you could use an external battery pack, you would just add two vias and draw traces to the battery terminals. Make sure to set the layer to “1 Top” before you draw. What if you also wanted to be able to mount this to something using screws, or hang it from a chain as a necklace? You could make holes using the Hole tool. Set the desired diameter and click to add holes. Step 8: Mill your board. 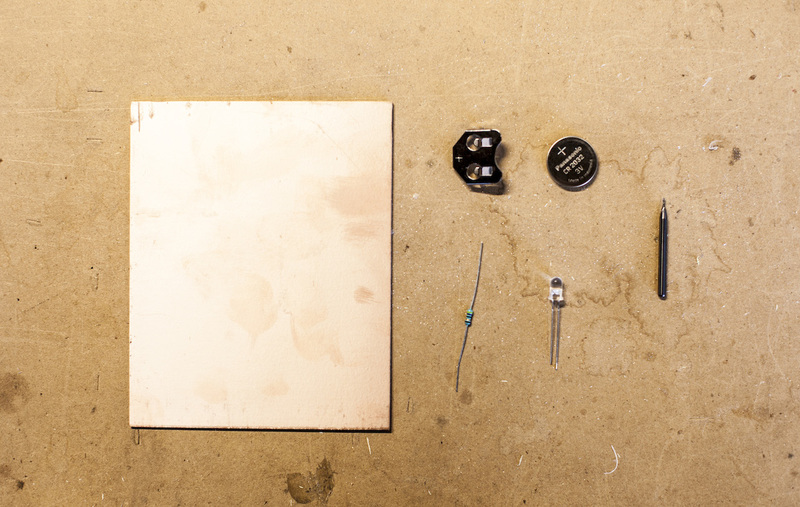 Here are the basic steps for milling your board on the milling machine. Open the software if it’s not already open. Click Import Files and select your .brd file. Make sure your material, tool, and other settings are set for single-sided FR-1 circuit boards. Once you finish cutting, solder everything together, put in a battery, and enjoy your lit LED! If you have any questions, email us at support@bantamtools.com, and we’ll be happy to help!